Lunch at Brio Tuscan Grille – This Girl Loves to Eat! I love business lunches and today’s was one of the best I’ve had in quite a while! Because I could make a reservation ahead of time (and earn more points toward free dining) using my OpenTable App, I tried a restaurant that I’ve never been to before, Brio Tuscan Grille in the Irvine Spectrum entertainment, shopping and dining center in Irvine, CA. The restaurant was a great choice because they are located near the valet, on the outside edge of the center, have a wide variety of foods to choose from, a daily chef’s choice menu, a gluten free menu, as well as a selection of lighter Italian dishes so we all could enjoy our meals completely. I started with a glass of Zig Zag Zinfandel to toast the partnership we were celebrating. The nose was a warm welcoming plum with a touch of vanilla. The body and flavor were bold but not too overpowering for my lunch selections. I was a really good girl and stayed away from the bread basket that taunted me with the intoxicating scent of warm sourdough baguettes, breadsticks and cheese crisps. My first course was the 150 Calorie Chopped Salad. I only ate half of it, but I loved the lightness of the chopped greens, cucumbers, red onions, tomatoes, Feta cheese and lightly dressed with Italian vinaigrette. I didn’t want to overeat, having ordered the main course off of the Light Menu that our waiter highly recommended: Shrimp Mediterranean. I devoured every last morsel! Atop a bed of orzo farro pilaf, broccoli, asparagus, spinach, plum tomatoes, and Feta cheese lay 5 perfectly grilled large shrimp that were drizzled with a delicious pesto vinaigrette. Magnifico!! At 470 calories with 17 grams of fat, 43 grams of carbs, 7 grams of fiber and a whopping 35 grams of protein, I was satisfied, but not uncomfortably full. Others I dined with ate from the light menu (Grilled Salmon Fresca) and the gluten free menu (Pasta Brio) and gave very enthusiastic thumbs up reviews to their choices. If you have a Brio Tuscan Grille near you, it is definitely worth a visit. Lunch for 4 with 3 of us having 1 drink plus iced tea all around came to $162. Not a lunch for those dining on a budget to be sure, and I would expect dinner to be half again as much per person, but certainly worth a splurge when dining for a special occasion or if you are looking to impress someone with great food, great service and a fun atmosphere. One drawback is that the high ceilings and echo off of the hard surfaces make the restaurant quite loud during it’s busiest hours. Another definite plus for dining at Brio Tuscan Grill is their participation in and support of Share Our Strength’s No Kid Hungry campaign to end childhood hunger in America. Their Founding Chef Phil Yandolino and the entire Bravo-Brio Restaurant Chain participate in this very important charitable organization. You can follow #TeamNKH on Twitter @nokidhungry. 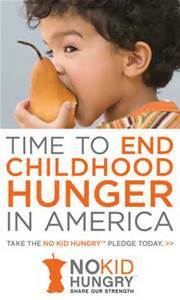 For a list of restaurants participating in September #dineout month in support of No Kid Hungry visit http://www.nochildhungry.org. Posted on September 24, 2015 September 30, 2015 by ls1228Posted in Charity, No Kid Hungry, Restaurant ReviewsTagged #TeamNKH, Brio Tuscan Grille, business lunch, Chopped Salad, Dine Out, gluten free menu, Grilled Salmon Fresca, Irvine Spectrum, Magnifico, No Kid Hungry, OpenTable.com, Pasta Brio, Raspberry Mojito, Share Our Strength, Shrimp Mediterranean, vvalet, www.nokidhungry.org, Zig Zag Zinfandel. Previous Previous post: I Like My Coleslaw With a Kick!